Note: The Share to collaborate feature is only available for Office 365 Education and Office 365 Commercial subscribers. To access Share to collaborate, please sign in with your school or work account. 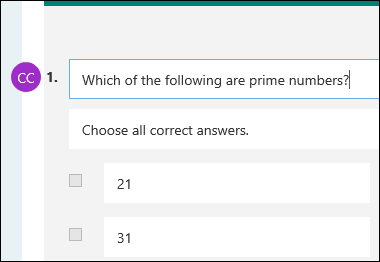 In Microsoft Forms, you can have multiple people collaborate on the structure and layout of quizzes and forms. When you share a quiz or form to collaborate, you create a special link which allows others to view and make changes to the design of a quiz or form you started. All contributors to your quiz or form can also view, edit, and delete responses. Contributors can also share the quiz or form with others by sending them the form collaborate link. To share a quiz or form to collaborate, follow these steps. In Microsoft Forms, open the quiz or form you want to share to collaborate. On the Share pane, click Get a link to view and edit. When you share a quiz or form to collaborate, it remains in your profile but other people can view and edit it through that collaborate URL. At the top of the quiz or form that you've shared, you'll see icons of the initials for each person making edits to the form. Microsoft Forms also displays contributor icons next to each section currently being edited. Need to stop sharing and remove a quiz or form collaborate link? Follow these steps. In Microsoft Forms, open the quiz or form which has the collaborate link. On the Share pane, click the Delete trash can button next to the text box that displays the form collaborate URL. Microsoft Forms displays a confirmation message. Click Remove link to remove the collaborate link. Click Cancel if you change your mind here and don't want to remove the collaborate link. Once removed, you can't recreate the same collaborate link. When other users now try to navigate to your quiz or form that you previously shared, they'll now see a permissions error page. 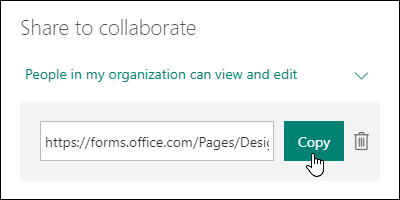 You can always create another new collaborate link again for your quiz or form if needed but it will be a new unique link. You'll need to send the new link to other people in order for them to continue collaborating on your quiz or form.